The E.A.S.Y Method For Improving Sleep! Every family, couple, and individual has some sort of predictable routine that happens during their day. For example you wake up in the morning, you eat lunch around noon and supper in the evening, and then you go to bed in the late evening. These daily similarities or routines help our bodies create structure in our day. It allows us to feel safe and in control when we have some predictability in our lives. Infants and children also like having this predictability. It allows their body to create structure that encourages healthy well-being. Having routine allows an individual to thrive when they are able to anticipate how and when their needs are going to be met. At birth it often seems like there is no way we can implement any type of “routine” as our little ones seem to just sleep and eat all the time. One type of routine that will help your infant develop the tools he/she needs to learn healthy sleep patterns is called an “E.A.S.Y” routine. This routine can begin right from birth until childhood and you can begin at any time if you have not already. E.A.S.Y is an acronym that stands for a sequence of events that is very similar to how adults live on a daily basis. 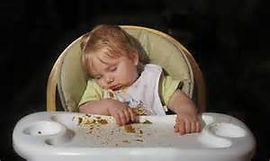 As infants this order of events only happens in shorter chunks as they have more sleep periods in a day than adults do. This daily routine is one that repeats itself throughout the day. When your child wakes up you begin with E which is the beginning of the routine. They will nurse/bottle/eat as soon as they wake up. After they are done their food they will have “A”, some activity. The activity is followed by S, a sleep period and last but not least, what comes with your little one sleeping is some YOU TIME!! This routine can help take the guess work out of “what does my baby need right now! ?” For example, if your baby wakes up, has a good feed, and is playing and then they get fussy, you will be able to predict that they are most likely ready for a sleep period. When your baby goes to sleep and wakes up upset or content, it will be safe to assume that she is hungry. Applying this routine is not always “easy.” It does take consistency and it involves a lot of baby watching. You want to be watching your babie’s cues and not the clock. It doesn’t matter what time of the day they wake up that feeding will always come at that time versus before going to sleep. Or even if they have a shorter activity period than the day before, fussing may be a sign that they are ready for that next nap. As much as you set the series of events, for the most part your baby will be setting the timing of events. Using their cues and working with their natural rhythm is a great way to find balance for the two of you. At the beginning after first starting the new routine allow a few days for everything to sink in. After all this may be different from the routine you are working with now even if just slightly. As your infant gets older then you will begin to see that the E.A.S.Y routines begins to happen on a more set timing schedule. Morning wake-ups will generally happen around the same time, Naps will begin to take shape and become more consistent and so will bedtime. This will allow for the periods of E.A.S.Y to happen close to the same times each day. This sequence of events can often help improve short naps and frequent night wakings. Many times infants will wake in the night because they will want milk to put them back to sleep as this is what put them to sleep in the first place. It is not bad it is just a natural body response. They remember when they wake up the last thing that was happening when they fell asleep. Using E.A.S.Y moves the milk and feedings to at wake up versus going to bed and so should help to eliminate wakings for food unless age appropriate feedings are still necessary. Another advantage of this sequence is that it may lead to more milk intake during the feeding times. The body is learning how to set feeding times based on their age. As they get older the space in between feeding times lengthens which leads to the E.A.S.Y routine pattern lengthening as well. When your little one is feeding when their body is hungry and ready to eat then you may notice your feeding times becoming more productive. E.A.S.Y is a DAYTIME routine. This routine should not be implemented at night. I think it is safe to conclude that no mommas out there want to have an activity time in between the feeding and back to sleep at 3 a.m.!! If you baby wakes from hunger during the night you feed them but then allow them to go right back to sleep. With the help of optimal sleep environments, see my healthy room environment blog, your little one should drift back into dreamland in no time! Depending on the age of your infant each E.A.S.Y routine will differ in length. Newborns are usually on a 2-3 hour feeding schedule which means that from one E to another E should be a max of 3 hours. Consider your infants age to determine about how long your daily routine should be. So, why would you consider using this routine?? Well, it is a healthy way to get you and your child through your day! All of the letters are interrelated so changes in one can affect the others. Your baby will be developing very quickly as time goes but the sequence of E.A.S.Y stays the same allowing for that constant predictability. The routine can help prevent your child from becoming overstimulated with too much activity which can lead to disruptions in sleep. The routine helps encourage healthy sleep patterns which helps your baby grow. A structured routine allows for you to be able to plan your day and anticipate some quiet time for yourself. If you are thinking that this daily routine might help to add some structure and predictability in your day and you have some questions please feel free to contact me! I would love to help you in your journey to better sleep! This information was taken from "The Baby Whisperer Solves All Your Problems" by Tracy Hogg. Alright, let’s start this post off with thinking about something amazing…turkey dinner!! Think about the last time you had a turkey dinner. You loaded up your plate, enjoyed every last bite, and then…..felt like you were going to fall asleep!!! What you eat affects how you sleep. Often people think about reducing caffeine later in the evening to encourage better sleep but rarely do we plan our dinner or night time snack thinking that it is going to benefit our sleep. I want to touch a little bit about how the foods that you choose throughout the day, specifically dinner and bedtime snack, can impact your families sleep. Sleepers – These are foods that contribute to restful sleep by calming the brain.These foods contain tryptophan which is an amino acid that is used by your body to create sleep hormones. Wakers – These are foods that contribute to restless sleep and keeping you away by exciting the brain.They contain Tyrosine which is an amino acid that blocks tryptophan from being absorbed therefore making you more awake. Many foods contain a combination of both tryptophan and tyrosine and it can often be difficult to find a good pairing to help encourage sleep. There is always a lot of more in depth research that can be discussed but here I am just going to give some tips using the research I have done on how to use foods to help encourage sleep at night! These tips can be used for all ages once your little one has started solids and can also work for adults!! - Pair high carbohydrate foods with proteins. The carbohydrates help the body to absorb the tryptophan which therefore helps you sleep. A high protein diet with low/medium carbs is better to eat in the morning or for an early snack as this will help keep you awake because many protein products also contain tyrosine. Potatoes (or other carb source) with meat for dinner.Vegetables too of course but we want the potatoes (carb) to work with the meat (tryptophan) to help calm the body. Peanut butter on bread, cheese on crackers and Greek yogurt and granola for bedtime snack. ** Note that not pairing a high carbohydrate with a protein can lead to increased energy as Tyrosine is now the dominant amino acid. - Eat B3 Vitamin (Niacin amino acid). B3 vitamin is actually a common ingredient in herbal sleep aids because it is known to extend parts of your sleep cycle and limits the number of times you wake up in the middle of the night. - Include omega-3 fatty acids in your diet. In a study it showed that foods high in these acids helped to enhance sleep because they increase the brain’s secretion of sleep hormones! - Avoid anti-sleep foods or foods that are irritating or hard to digest for dinner and nighttime snacks. Ice Cream – its fat content can slow down digestion making it uncomfortable for you to sleep. Citrus Drinks – These beverages can irritate the esophagus (throat) and cause inflammation. Spicy Foods – Can irritate lower part of esophagus. Legumes – Can produce gas and inflammation especially young children or individuals who are not used to eating vegetables regularly as they will not have the enzymes needed to digest them. Chocolate Brownies – These contain caffeine from the chocolate and can also cause the lower part of your esophagus to relax which leads to acid reflux. Raw Onions – Have effects on your stomach and leave a strong after taste that can be distracting. Fried Foods – Can cause stomach discomfort. Broccoli and Cabbage – Cause plenty of gas in intestinal tract because of their fiber and nutrient content. Popcorn – MOVIE NIGHT!! !Unfortunately popcorn is just puffed corn kernels and so is very common in producing inflammation and gas in the intestines. ** I want to stress that many of these foods DO HAVE nutritional properties and so should not be eliminated from your diet. It is just recommended that these types of foods be eaten earlier in the day so that they do not negatively impact your families sleep for the reasons above. Every individual is unique! If the foods listed above do not cause any symptoms for you then that is great and you should continue eating them whenever you like. This list is just to bring attention to some foods that may cause discomforts during sleeping if you are trying to figure out sleep disturbances for yourself or your children. Often children don’t know why their “stomach” hurts but it may have something to do with what they had for dinner. I hope that the above tips can help you and your family find the perfect dinner meals and bedtime snacks to keep sleep on track!! Who doesn’t love to eat and now you can eat to sleep!! Exhausted Parents.... You need sleep too!!! How long should my baby be awake in between naps? The Infant 4 Month Sleep Regression.